Reflections Finishes in Top Ten! 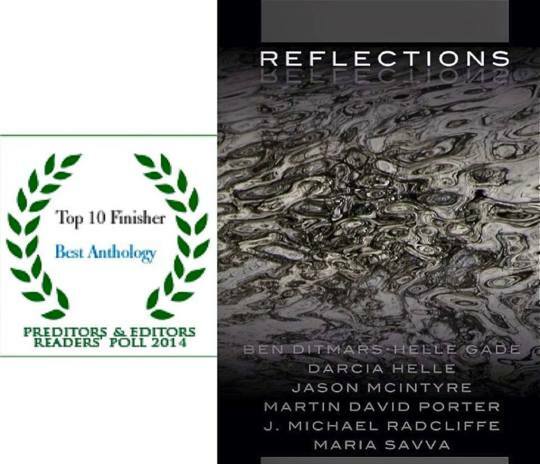 Reflections was voted a top ten finisher in the Preditors & Editors Readers’ Poll for 2014 for Best Anthology. It has been a pleasure working with talented authors and friends: Maria Savva, Helle Gade, Darcia Helle, Jason McIntyre, Robert Helle, Martin David Porter, and J. Michael Radcliffe. Thank you everyone who voted for our book. This entry was posted in promotion and tagged books, reflections. Bookmark the permalink. I have my paperback copy and will cherish it, dearly! Aw, thanks! It shall cherish the Bog.